On Saturday morning, scores of North Park families and friends turned out to call for protected bike lanes on 30th Street. From 6 year olds on training wheels to 66 year olds on road bikes, the mood was joyous as District 3 Councilmember Chris Ward and staff from the Mayor's office spoke and rode in support of creating protected bike lanes on 30th Street. 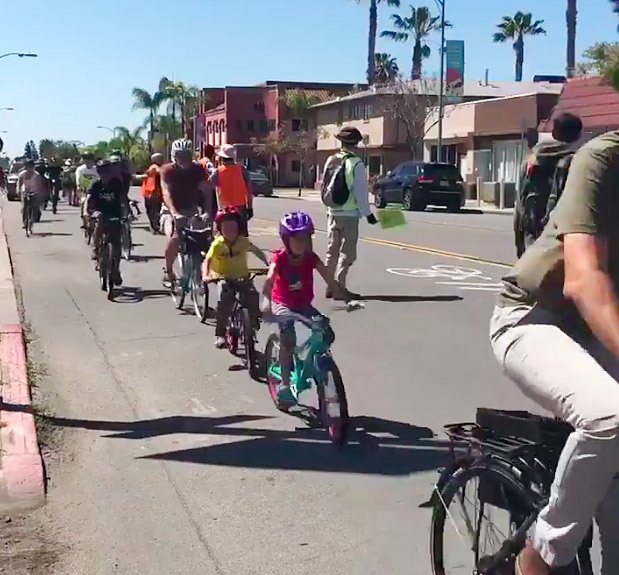 And then more than 150 bike riders led by BikeSD board president Nicole Burgess set off from Bird Park to create a line of bike riders stretched for blocks along 30th Street. 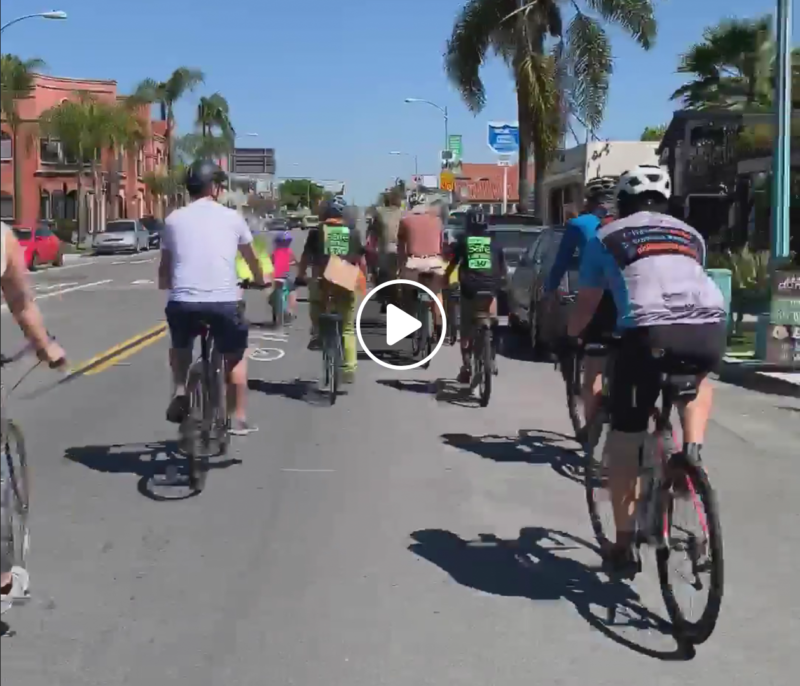 And in a first for San Diego, these riders passed through a "people-protected lane" created by two dozen activists on the very street where the city of San Diego is considering adding new bike lanes. Back in July 2018, we knew the five year old planning effort behind the Monroe bikeway was in trouble. The Kensington-Talmadge community planning group (Ken-Tal) declined to vote on the latest version but they clearly resisted improvements to this corridor. 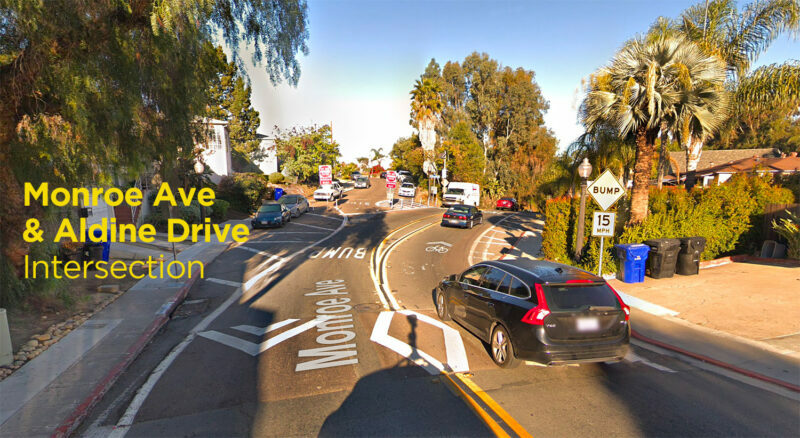 Both Kensington-Talmadge and BikeSD were told that San Diego traffic engineers would study possible solutions to keep traffic on El Cajon Boulevard. It’s unclear if those studies were ever completed. 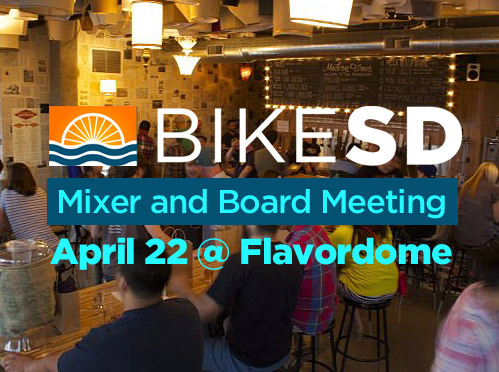 BikeSD warned that Ken-Tal would not allow any solution that allowed for safer conditions on a route connecting Mid-City and San Diego State University area. On a Friday afternoon, February 21, 2019, the San Diego Association of Governments (SANDAG) announced they were abandoning the current Monroe Bikeway effort. Monroe Avenue was identified as a primary bicycle route in both the current Mid-City and College Area community plans. 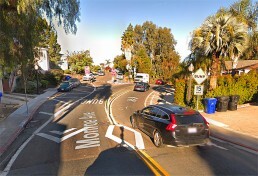 In SANDAG’s alignment analysis in 2014, Monroe was selected for its lower level of stress for bicyclists and its lower cost compared to a cycle track on El Cajon Blvd. At the time, BikeSD and others advocated for cycle tracks on El Cajon Blvd. 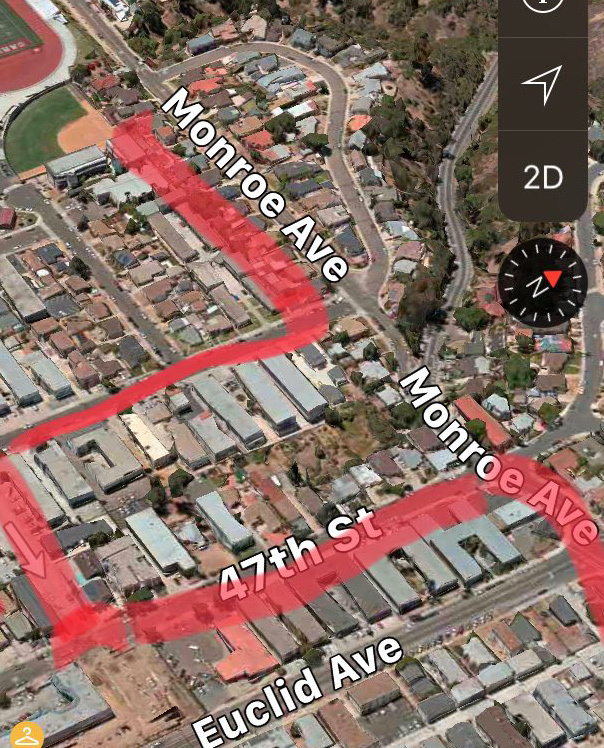 However, SANDAG and City of San Diego choose to pursue the Monroe segment to connect North Park/Mid-City areas to the neighborhoods around San Diego State University. SANDAG Bike Plan Map showing Monroe bikeway (magenta colored line). Most of the controversy about the planned bikeway is about the 0.1 mile section of Monroe Ave. from Aldine intersection to 47th street. While this section suffers from high automobile volume, is it really worth abandoning the remaining 1.2 miles of bikeway improvements? In the past five years, many designs for the intersection of Aldine and Monroe have been proposed but according to SANDAG emails, yet no design was “feasible” to meet of all the constraints imposed from various interested parties. The lack of consensus around a solution doomed the project. Currently, westbound Monroe and Aldine is a tricky intersection. Aldine Drive is a one of three entry ramps that connect to the Interstate 8 freeway. Area residents also have Fairmount to the west and Collwood to the east, both higher capacity entry points than Aldine Drive. Cyclists traversing this corridor have few choices: dangerous El Cajon Boulevard to the south, or detouring very far south to Orange. Westbound bicyclists on Monroe currently have no legal route to continue on westward besides using the sidewalk. 1) Two-way cycletrack on south side of Monroe: (Potential designs here and here.) The possibility had support from some Ken-Tal planning group members who supported trying to prevent left turns from 47th St onto Monroe. 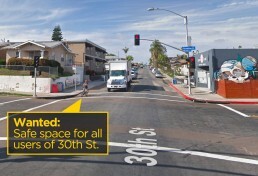 However, City of San Diego instructed SANDAG that it would not support any modifications of 47th St. This prevented the design from further evaluation including solving potential challenges of narrow road width. This design was abandoned in 2015. 2) HAWK signal: In 2016 and 2017, SANDAG presented a HAWK signal to allow bicyclists (and pedestrians) to cross the intersection when a bicyclist triggers the HAWK. The Ken-Tal planning group asked for the HAWK removed in 2017. District 9 Councilmember Georgette Gómez’s office did not support the HAWK either. Both CM Gómez and Ken-Tal CPG were concerned about vehicle delay caused by the HAWK. It’s important to note that SANDAG presented traffic studies in 2017 that showed minimal delay (~2 sec). In 2018, it SANDAG presented different traffic model data but that model did not include analysis that included HAWK signal. 3) Bike left turn pocket: This design was SANDAG’s first concept design introduced in 2014. It’s simply a left turn pocket for bicycles only. It legalizes an action that some cyclists already make to continue westward on Monroe. This protected pocket would make it feel safer. It was reintroduced after the HAWK signal was removed from consideration upon Ken-Tal CPG request in 2017. However, City of San Diego traffic engineers rejected this concept in fall of 2018 due to limited sightlines and high traffic volumes. 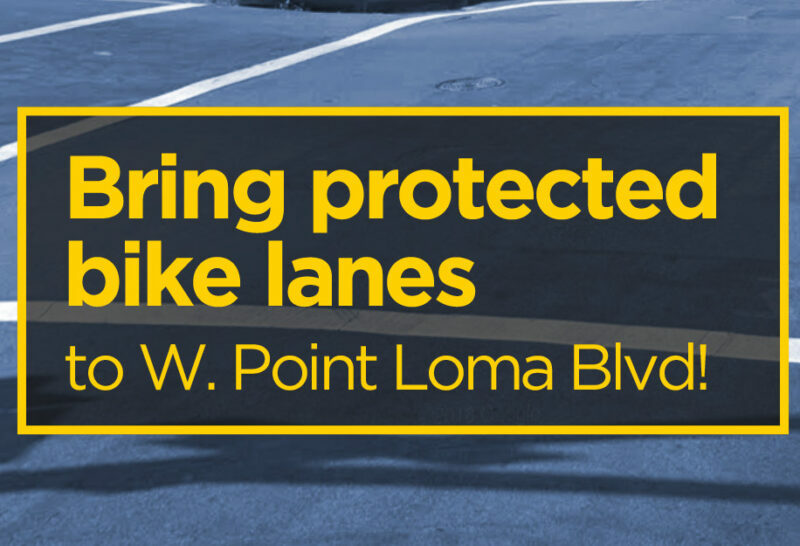 Considering neither sightline nor traffic have changed since 2014, why did City of San Diego engineers not relay their concerns about a bike turn pocket prior to 2018? 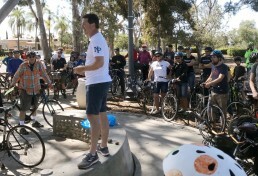 The lack of communication between City of San Diego and SANDAG is a common theme throughout SANDAGs early action bike program. 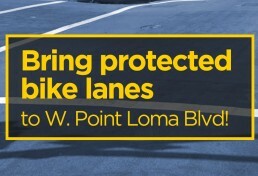 4) Bike left turn pocket + 1/2 HAWK signal: An innovative solution proposed by SANDAG combining the turn protection of left turn pocket with HAWK beacon to stop southbound traffic and allow a safe crossing for cyclists. This solution would alleviate any fears about a HAWK signal effects on vehicle delay for Northbound morning commute. It also addressed the concerns of City of San Diego traffic engineers about sightlines. City of San Diego traffic engineers rejected this option. Can a future planning grant solve the problem? Unfortunately, we have recent experience with a mobility planning grant in this exact neighborhood. The City of San Diego received a planning grant to improve mobility for pedestrians and cyclists along the section of El Cajon Blvd parallel to the planned Monroe Bikeway. Again the Ken-Tal planning group led the charge to have bicycle improvements removed from the plan. At the time (2016), Ken-Tal CPG members told KPBS that they supported bicycle routes on side streets, including Monroe but opposed them on El Cajon Boulevard. The Monroe bikeway suffered not because of a lack of funding but a unwillingness to prioritize bicyclists safety. Until your favorite SANDAG bike project is in construction, everyone should be nervous of a Friday email that announces your neighborhood bike project no longer exists.